Womens wooden boxes, luxury jewelry boxes, & standing armoires to protect her treasures! Handsome valet boxes, leather trays and watch display cases for men will organize collections. Music boxes and jewelry boxes for little girls and teens will delight the girls on your gift list. Jewelry Boxes: Buy a quality Jewelry Box Today. Choose from hundreds Online. 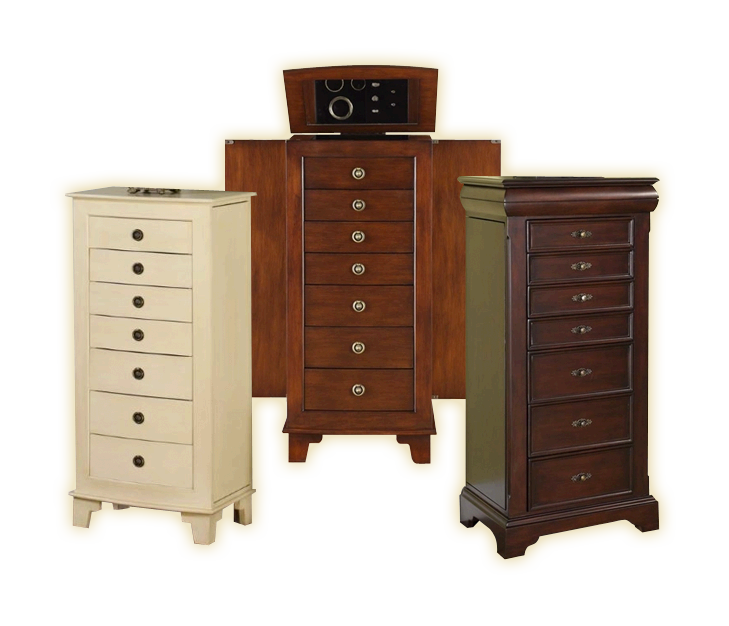 Locking jewelry armoires safely & securely store large collections of jewelry and necklaces. Our locking jewelry armoires come in several finishes and styles, and are hand-crafted and fitted with luxurious lining; they'll last a lifetime! Valentine's Day is upon us, shop now for that perfect treasure that she'll open again and again! ChasingTreasure is here to provide you with luxurious and elegant womens jewelry boxes and chests. Our womens jewelry boxes are a gifts that she can pass on to her daughter or niece as a treasure heirloom. We have a large selection of wooden jewelry boxes that will fit any size jewelry collection. A standing jewelry armoire is the largest jewelry box and will hold it all: necklaces & chains, the largest earring collection, bracelets, and dozens of rings. Since many jewelry items are not worn frequently, they are still treasures that should be stored safely, so be sure to shop our locking jewelry boxes. Our luxury jewelry boxes are made of solid cherry, bubinga-wood, and other types of elegant wood. A hand-made wooden womens jewelry box will last for decades, making it a terrific heirloom gift. And a jewelry armoire is a perfect addition to the bedroom decor. ChasingTreasure has the right luxury wooden jewelry box and the best value on the internet! And don't forget to look at our large standing jewelry armoires.